and long-awaited New Jersey studio recordings. Not for everyone, Everything may sound raw and unpolished at first hearing, but R. Stevie's deft, Zappa-inflected talent for timeless parody persists until---voila! another RSM convert is born. Other comparisons have included Todd Rundgren; Moore has an endearing gift for writing touching ballads, barbed satire, hook-filled rock 'n' roll, you name it. His prodigal one-man band approach and home studio wizardry at time recall the rough-hewn tortured artist effect of Rundgren's Runt and Something/Anything? 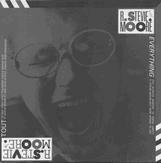 �The R. Stevie Moore mini-phenomenon grew in the early '80s from scattered appearances on obscure import compilationss and hand-made, real time-dubbed cassettes distributed through his RSM Cassette Club. The majority of tracks on Everything are from the latter and this is their first appearance on vinyl. This $11.98 list double album is an offbeat delight and true sleeper from a founding member and crusader of the growing international independent cassette underground.